Librarian, Teacher, and avid reader of all things YA. Here’s a great summer reads author for you guys: Jennifer Echols! Echols’ books are romantic dramas with a sense of humor – she’s so good at writing a developing romantic relationship between two characters that you’ll feel like you’re there with them. The three pictured here, Forget You, Going Too Far, and Love Story, were the first books I read this summer… and I went through them all in about three days. For content reasons, I’d recommend these to teens in their upper high school through college years. I’m pretty conservative with my recommendations, I know, but that’s just me. Overall, the stories here are engaging and I loved watching each romance spark and ignite. Echols has a new title, Dirty Little Secret, coming out in July. I’m looking forward to it! Somehow, Crash came out a while back without me knowing… I’ve had Lisa McMann on my radar since I read her Wake trilogy a few years ago, which is excellent. 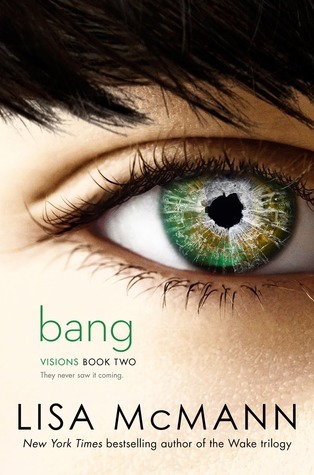 So, I was surprised when I received an Advance Reader’s Copy of Bang, which is her upcoming sequel to Crash, because I didn’t even realize Crash existed.I know, this is a problem only in the book nerd world to which I belong. Anyway, I couldn’t dive into the ARC of Bang without reading Crash first, so I got my hands on a copy of it yesterday. And I read it last night. Couldn’t sleep until I had it finished. It was really, really good. And then, of course, I devoured Bang as soon as I woke up this morning, and it’s good. Just as good as Crash, if not better. I have two favorite things about Lisa McMann’s writing. One, her characters are so well-written that they feel like real people. I take a break from reading to do something else that needs to be done, and it’s like I’m shocked when I put the book down and the character isn’t really there. It’s unnerving in the very best way. Two, she does paranormal in a way that makes it kind of normal. Like, it’s not some weird witches and vampires crap. It’s normal people, with normal lives, in normal settings… but something happens to them that is paranormal. This is also unnerving in the very best way – it makes you feel like it could happen to you any moment. It’s great. 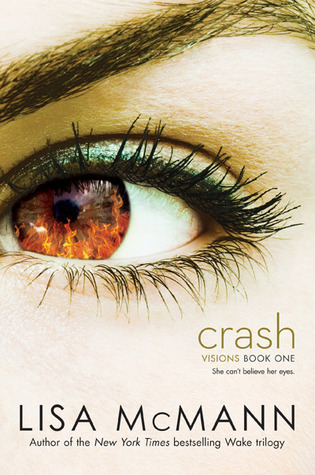 I highly recommend Crash, as well as her Wake trilogy, for high school and up. There’s some language and sexually-charged intense moments, but nothing over the top, really. I wish the language were tamer. Bang, which I also highly recommend, will be out in October 2013. I’m hoping to feature it on She Reads closer to its release date. For now, though, enjoy the titles that are already out! 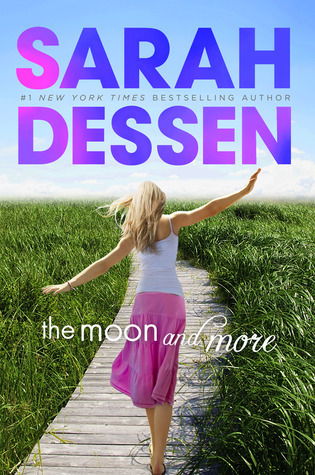 Dessen’s Latest… Not Her Best. I’ll start by saying that I’m generally a fan of Dessen’s, and several over her titles have made their way to my Goodreads “favorites” shelf. See my previous write up for The Truth About Forever. 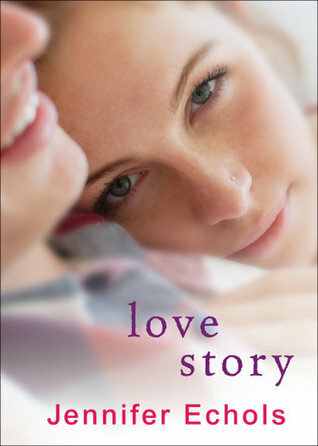 One thing I love about many of her books is the summery beachiness and good, clean, fun teenage romance. Many of her books take place in a fictional (though clearly Carolina) beach town called Colby. Seeing so many of the characters and stores and landmarks show up again and again is cool, but there were so many references to Colby residents from previous books that I feel like I need a Colby directory because I couldn’t remember everything. I didn’t feel like The Moon and More was full of her best characters, either. I found Theo completely unlikable and thus super annoying, which hindered my ability to connect with Emaline when she didn’t agree. I did really enjoy the family relationships between Emaline and her mom, sisters, and Benji, but then I wanted to throw something at her over Luke (who I really did like, because who doesn’t like a shirtless beach house pool boy?). I mean, it was good as Dessen always is, but not my favorite of hers by a long shot. 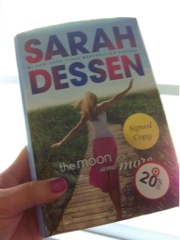 How did I not know that local Target stores had signed copies of Sarah Dessen’s new release, The Moon and More?! Needless to say, I snatched one up when I saw it this morning. I can’t wait to read it! I absolutely LOVE to read. I call myself a book nerd all the time, and it’s not at all uncommon for me to read 2-3 books per week. There’s really something special about a good character becoming like a friend over the course of three hundred pages, or a plot line really digging into your brain so you can’t get it out of your head until you finish the book. I crave good stories. It’s weird. I can’t say, though, that I’ve ever been thoroughly satisfied as just a reader. I also want to write stories – create these characters and plots that people won’t be able to forget. It’s a huge goal, I know. But I’m working on it. A few months ago, I was talking (probably more like whining) about this goal of mine and feeling like I’d never get there, when my husband looked at me and said, “If you wrote as much as you read, you could write a book in a couple of weeks.” Well, that turned out to be a little bit of an exaggeration, but he was pretty much right… and now, a couple of months later, I’ve finished my first book and have it in the hands of some amazing beta readers. I can’t wait to hear what they think. For now, though, I’ll share a little excerpt here. It won’t make too much sense taken out of context, of course, but you’ll get a taste of the protagonist and the main guy. The working title right now is Because You Should Be Mine. Enjoy! I drank in the sight of him standing there in the faded light of the entryway, the warm Southern fall night dark behind him. His long sleeve shirt hung over his six foot two inch frame from his muscular shoulders, sleeves pushed up on tanned and toned forearms. His shirt was barely tucked into the front of his well-worn, tattered and holey jeans slung low over his hips and held in place with a wide belt. On his feet were the ever present Rainbow flip flops that he’d been wearing outside of school since we were little kids. I mean, he’d had different pairs, of course, but he had always been all about a good beach shoe. The tan on his feet proved it. He looked good. My eyes scanned upwards, taking in his crazy, disheveled brown hair that looked like it was permanently blowing in ocean winds, then to his face. As I registered the look of alarm that was there, his eyes found what they were looking for… Me. Our eyes latched on and didn’t let go this time. I felt my breath leave me in a rush as I registered the fact that he was approaching the table I was sitting at with Lanie and Kate. Snapping back to reality, I looked back and forth between my friends. Kate stammered, “Right. Well, we’ll just be going. Call me later, Cass.” She and Lanie headed toward the door that Tony’s hot self had just come through, casting glances back at me as they left. “You’re dirty? That’s new.” I heard Tony’s voice rumble with amusement as he gestured toward my cup, which was marked “dirty” – The Brew’s way of marking its contents. Guess I’d marked my own dirty chai cup out of habit. But dang, that voice had gotten even deeper since the last time I’d heard it. I felt the effects of its deepness as my whole body responded, grateful he could only see the blush on my face. “Well, yeah. I mean I need some help, and I thought of you.” Tony looked towards the door and wrung his hands together. His forehead was creased as he brought his gaze back to mine. His eyes, usually a clear tropical ocean blue, were weary and red with worry. Given that, clearly, something was very wrong, I suppressed the urge to squeal over the fact that he’d thought of me. Colleen Hoover, I’m a FAN. Words really can’t express how much I love these books. And the fact that I don’t have a copy of the third and final related book, This Girl, right now is just killing me. I’ll confess that I’ve loved the whole idea of performance poetry ever since Mike Meyers’ role in So I Married An Axe Murderer. I don’t know if Colleen ever imagined her beautifully written books being written about in the same blog post as the cheesy Meyers’ role, but I’m going for it. Anyway, performance poetry is just COOL in a way that I feel like I’ll never be cool enough to perform it. And it’s powerful. To listen to and watch someone perform a poem is a really wonderfully moving experience. 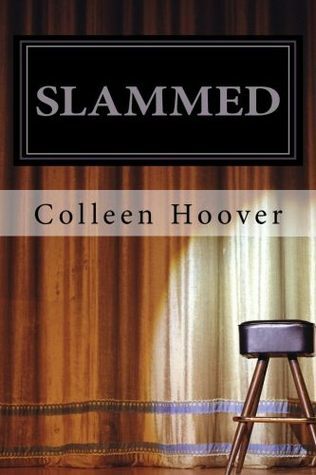 So, when I read the little synopsis for Slammed and realized it involved slam poetry AND an incredibly hot, magnetic romance, I absolutely had to read it. 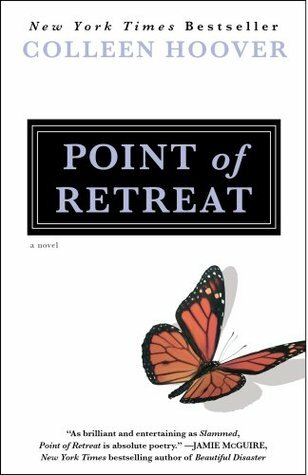 And then I absolutely had to read Point of Retreat. And now I absolutely have to read This Girl, which just came out recently. You totally don’t have to be an existing fan of slam poetry to read these books, but I do think you’ll gain an appreciation of its power to convey emotion and deliver a message emphatically through the poems that are artfully woven throughout the books. And it’ll probably make you want to find a slam poetry night in your city and go watch. I know I do. But enough about the poetry – Hoover’s characters and the way they interact with each other are great. The instant connection and ensuing romance between Will and Layken is SO ADDICTING. The life situations they find themselves in, together with the other characters, make you root for them. They’re so right together, even though they go through more crap than any couple should have to endure. I highly, highly, highly recommend these books (definitely upper high school and older). I love them. You should too. Get my book recommendations delivered to your inbox!